Thomas Lee of Canada was the most consistent player from start to finish in Day 1B of the APT Asian Poker Series Cebu Main Event and became the overall chip leader after hauling 131,800 in chips in the tournament held at the All In Poker Club at the Waterfront Hotel & Casino Lahug in Cebu, Philippines. The Canadian, who has had deeps run in tourneys the last two years in various poker tours, now leads not only the 45 survivors from Day 1B but the entire field of 70 playing in Day 2—after 27 players advanced from Day 1A. Three other players—Jessie Leonares (Philippines); Onda Toshiyuki (Japan); and Min Soo Kim (Korea)—also had a great day on the felt as all three finished over the century mark. Completing the top five entering Day 2 is Gerard Mark Bringley (Japan), who topped the yesterday’s Day 1A. Two players—Linh Tran (Canada) and Anthony Wright (Ireland) are the “double qualifiers” as both chose to play in Day 1B despite already qualifying from Day 1. It was a very good decision for both as they upped their stack entering Day 2; Tran from 6,000 to 41,100 and Wright from 10,050 to 46,550. 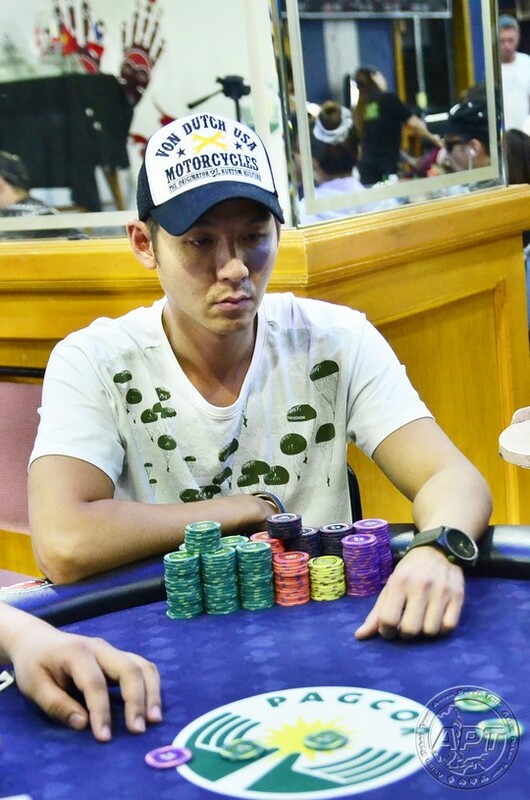 Other notable pros who advanced from Day 1B are Kosei Ichinose (Japan) with 67,450; Mike Kim (Korea) with 57,125; Jun Funabashi (Japan) with 52,525; Seitaro Aso (Japan) with 41,425; Norbert Koh (Singapore); Ian Brion (Philippines) with 27,725; Martin Gonzales (Philippines) with 26,175; and Jae Kyung Sim (Korea) with 21,450, among others. From the 160 total entries from both Day 1s, the prize pool was set at PHP 7,139,000 with the lion’s share of PHP 1,824,000 going to the next APT main event champion. 18 players will be in the money with the minimum payout set at PHP 132,000. The main event restarts at 1:00 PM Sunday and two more side events are on tap the same day; the NLHE (PHP 13,200 buy-in) and the MegaSportsWorld Deep Stack Turbo (PHP 5,500) events at 3:00 PM and 7:00 PM, respectively. For complete details, check the Event Schedule page.